Vanessa “Michael” Munroe deals in information—expensive information—working for corporations, heads of state, private clients, and anyone else who can pay for her unique brand of expertise. Born to missionary parents in lawless central Africa, Munroe took up with an infamous gunrunner and his mercenary crew when she was just fourteen. As his protégé, she earned the respect of the jungle’s most dangerous men, cultivating her own reputation for years until something sent her running. After almost a decade building a new life and lucrative career from her home base in Dallas, she’s never looked back. A Texas oil billionaire has hired her to find his daughter who vanished in Africa four years ago. It’s not her usual line of work, but she can’t resist the challenge. Pulled deep into the mystery of the missing girl, Munroe finds herself back in the lands of her childhood, betrayed, cut off from civilization, and left for dead. If she has any hope of escaping the jungle and the demons that drive her, she must come face-to-face with the past that she’s tried for so long to forget. My rating: 4/5 Stars – A good read. I really enjoyed it. The Informationist is the ideal escapist read. It’s exciting and fast-paced with a great mystery at its core. The protagonist is more than a little over the top – she’s a brilliant, badass, emotionally damaged adrenaline junkie with ninja-like skills and a tragic past who speaks 22 languages. Ridiculous, I know, but it was so much fun. A big part of what makes the story interesting is the locale. The author truly brings the setting to life with vivid descriptions and insight into the culture, politics, and socioeconomics of Equatorial Guinea and its neighboring countries. Despite the noticeable (and slightly disturbing) lack of good-guy POC characters, I couldn’t help but enjoy myself as I explored a part of the world completely different from what I normally read. The story gets surprisingly tense and emotional towards the end. Even though I guessed who the villain was early on, there were still plenty of surprises. I could hardly put it down. 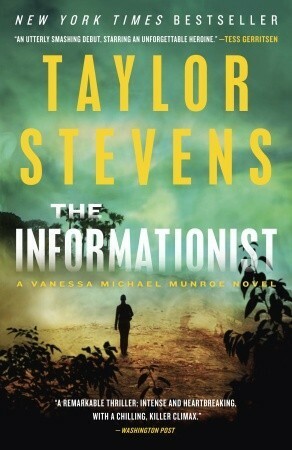 I definitely recommend The Informationist for mystery and thriller fans, and perhaps some romance readers as well. This entry was posted in Review and tagged 4 stars, books, mystery, reviews, Taylor Stevens, thriller. Bookmark the permalink.